Countermeasures against various stresses : It is the shipowner’s responsibility to ensure that his vessel is built to a standard high enough to withstand all the stresses she may be expected to encounter. By their very nature ships are called upon to carry heavy loads, and considerable thought and experience is required to load heavy weights without causing structural damage to the vessel. 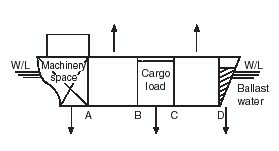 Heavy weights tend to cause a downward deflection of the deck area supporting the load .This subsequently produces stresses, with consequent inward and outward deflections of supporting bulkheads, depending on the position of initial loading.These stresses are generally of a localised nature, in the neighbourhood of built-in structures such as windlasses, accommodation blocks etc. and increased scantlings are the norm to prevent excessive distortion.The shipping of heavy seas may add to the load and aggravate the situation, causing unacceptable, excessive distortions. Another form of stress comes from the water surrounding the ship, which exerts considerable pressure over the bottom and side areas of the shell plating .The pressure will increase with depth of immersion, i.e. the pressure on the bottom shell plates will exceed that on the side shell plates. Water pressure does not maintain a constant value, and will vary when the vessel is in a seaway, especially when a heavy swell is present. Fluctuations in water pressure tend to cause an ‘in and out’ movement of the shell plating, with more noticeable effects at the extreme ends of the vessel.The effect of water pressure is usually more prominent at the fore end of the vessel than the after end.The general effect is accentuated by the pitching motion of the vessel and is termed ‘panting’. Panting beams, which are substantial metal beams running from port to starboard, in the forepart of the vessel.They are positioned forward of the collision bulkhead to resist the in and out motion of the shell plating either side of the fore and aft line. Situated at various deck levels, panting beams form a combination with panting stringers on either side in the forepart of the vessel. A third form of stress is shearing stress in a material, which tends to move one part of the material relative to another. The two forces of gravity and buoyancy acting in opposition causes the shearing stress to be experienced at various points in ship. Shearing forces are undesirable within a ship in any shape or form, and prudent loading, together with careful ballast distribution, can reduce them. Shear stress at critical points. The information supplied depends on the make and type of software employed. The length of the vessel may be considered to act like a long girder pivoted on a wave about its centre. In this position the fore and after ends of the vessel will bend downwards, causing compression forces in the keel area and tension forces at the upper deck level. The condition is brought about by increased buoyancy forces being created at and around the midships point of the vessel. Increased gravitational force, due to the metal structure of the vessel acting vertically downward, occurs at the extremities of the ship.When both forces exist at the same time, e.g. as the vessel is pivoted by a wave midships, a ‘hogging’ condition is present. This can be accentuated in a vessel of an all-aft design, where the additional weight of the machinery space would produce high loading in the aft part of the vessel.The condition may also be unnecessarily increased by ‘bad’ cargo loading in the fore and after parts of the vessel, leaving the midships area comparatively lightly loaded. ‘Sagging’ is the direct opposite of hogging. When a vessel is supported at bow and stern by wave crests, she will tend to sag in the middle. High buoyancy forces occur at the extremities of the ship. High gravitational forces, from the weight of the ship’s structure, act vertically down about the midship’s point, in opposition to the buoyancy forces. In comparison with the condition of hogging, the vessel has a tendency to bend in the opposite direction . Incorrect loading of the vessel or design characteristics may accentuate the condition of sagging.Watchkeeping officers should be aware of the frequency of the waves and the likelihood of this condition developing and, if necessary, take action to relieve any sagging or hogging conditions by altering the ship’s course. Due consideration at the time of loading, with regard to weight distribution may alleviate either hogging or sagging.With shipbuilding producing larger and longer ships either condition is most undesirable, as the prospect of breaking the ship’s back in a heavy seaway or swell becomes a frightening reality. Prudent ballast arrangements, together with increased scantlings at the time of building, coupled with efficient ship and cargo loading, will help minimise any structural damage at a later stage due to hogging or sagging.